It was a dark lonely night. Though it was not raining, the sky was overcast and there was a sinister darkness all around. To add to the gloomy mood was the heavy wind, raising the dust, waiting to make me a part of it. For some lost moments in my history, I did not know what happened. When the senses came back with the urgency of a kolkata tram, I uttered "so-did-i" survive that? Hold on! that is not the story behind this blog and me. Why this interest to tell about the story behind this blog? I was lazy all this while not to tell this. Though it is not as dramatic as the narration above, it has some elements to it which might interest you to probe things further. I used to have and still have about three - four more blogs, which have no posts for ages. That is not to say that they lack good content. Those of you interested might read my Israeli journal at The Haifa Post, Stories from the Nether is a where I write my short stories, you can find some timeless stuff in the technology domain at Techno Whizz. This blog so-did-i used to have a different url, and I don't remember it any longer. It was some time in the spring of 2006 that, I an incorrigible optimist found myself at the abyss of despair and disillusion. It was around this time that the titanic of relationship hit the iceberg.Aound this time, I came across this small simple book Eats, Shoots & Leaves by Lynne Truss. 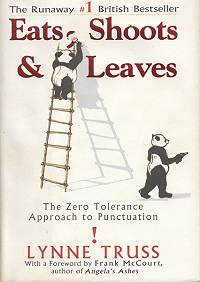 The book talks about the usage of punctuation and how it effects the meaning. The following is what Wikipedia entry says about the title. It was amusing and thought provoking at the same time. I was not interested in anything at that time, was just moving through my work mechanically. It was at this juncture that I hit upon this book and was immensely drawn towards the spirit of the content. A few days later, I felt better and started blogging again. I felt an urge to change the blog url. Inspired from the book sighted earlier, it became so- did- i. The thing in my mind was "so, did i come out of the depression?". And suddenly it struck me that the words "so did i" meant different things, depending on where I position the punctuation. And thus was born this blog christened. The title of the blog during those days was "i Think, i Wait, i Fast" my favorite quote from the book titled Siddhartha written by Hermann Hesse. My life also took a different note about this time, I decided to quit a well paying job at Intel to tread the path of entrepreneurship. The focus of the posts shifted to technology and a few random things that I wanted to write about. I was brimming with enthusiasm and the title of changed to "iDeas gAlore", an inspiration from pluggd.in when it was called "idea Labs". I left the entrepreneurship path in the month of February 2007 and a little after I got my current job, i started blogging about startups in India, entrepreneurship, and lot of other things. It was around this time that I got interested in design, usability and user experience. A lot of layout changes and design changes later, you see the blog in its current form. It is a very tough job to maintain posting regularly, but I believe I did a decent job till now. The learning I got from blogging is immense, I also got to meet some amazing people through it. There is nothing in this world for which I would give away my blogging. As mentioned earlier, it is increasingly difficult to maintain the expectations that this blog has raised. I am very happy that people know me my by the blog name rather than my given name. This blog now has become a center for usability and design. I will keep writing on those topics for some time to come with occasional drifts to startups, entrepreneurship, and all other things that interest me. Thanks to all of you for reading this blog. Would love to hear from you on what you feel about this blog. I guess most of the bloggers initially have 3-4 blogs and later on zero-in on one :) May be, blogging would have definitely made your mind more Entrepreneurial than before since,it is an amazing tool. Looks like a lot of thought-process went behind the nomenclature ... interesting to know. Very interesting post Ramji . Loved reading it . yes, i had lot more than 3-4 blogs. and i agree my blogs actually made a lot of difference. was supposed to be there in delhi this weekend, but was there at hyd half marathon!